اکبری جونوش, زهره, فرزادکیا, مهدی, ناصری, سیمین, مهاجرانی, حمیدرضا, اسرافیلی دیزجی, علی, کریمی تکانلو, لیلا. (1395). سنتز جاذب C14/Fe3O4@SiO2 و بررسی کارایی آن در حذف اورانیم از محلول‌های آبی و پساب واقعی با استفاده از ماده واسطه بنزامید. مجله آب و فاضلاب, 27(4), 36-44. زهره اکبری جونوش; مهدی فرزادکیا; سیمین ناصری; حمیدرضا مهاجرانی; علی اسرافیلی دیزجی; لیلا کریمی تکانلو. "سنتز جاذب C14/Fe3O4@SiO2 و بررسی کارایی آن در حذف اورانیم از محلول‌های آبی و پساب واقعی با استفاده از ماده واسطه بنزامید". مجله آب و فاضلاب, 27, 4, 1395, 36-44. اکبری جونوش, زهره, فرزادکیا, مهدی, ناصری, سیمین, مهاجرانی, حمیدرضا, اسرافیلی دیزجی, علی, کریمی تکانلو, لیلا. (1395). 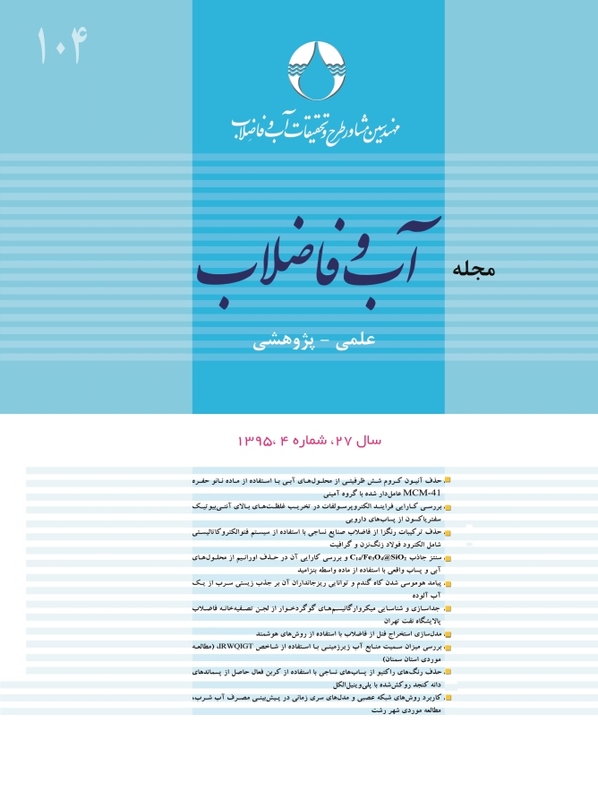 'سنتز جاذب C14/Fe3O4@SiO2 و بررسی کارایی آن در حذف اورانیم از محلول‌های آبی و پساب واقعی با استفاده از ماده واسطه بنزامید', مجله آب و فاضلاب, 27(4), pp. 36-44. اکبری جونوش, زهره, فرزادکیا, مهدی, ناصری, سیمین, مهاجرانی, حمیدرضا, اسرافیلی دیزجی, علی, کریمی تکانلو, لیلا. سنتز جاذب C14/Fe3O4@SiO2 و بررسی کارایی آن در حذف اورانیم از محلول‌های آبی و پساب واقعی با استفاده از ماده واسطه بنزامید. مجله آب و فاضلاب, 1395; 27(4): 36-44. امروزه موضوع جداسازی و حذف اورانیم از لحاظ مسائل محیط‌زیستی، بهداشتی و استراتژیکی اهمیت فراوانی یافته است. این عنصر دارای کاربرد مهم و پرسودی است که پژوهشگران را به‌سمت شناسایی روش‌های حذف اورانیم همراه با احیای آن کشانده است. در این پژوهش با سنتز جاذب C14/Fe3O4@SiO2، و با ایجاد کمپلکس اورانیم بنزامید سعی در حذف اورانیم بر روی جاذبی با قابلیت احیای مناسب شد. ابتدا جاذب Fe3O4@SiO2 سنتز و توسط ماده‌ی تری‌اتوکسی‌سیلان اصلاح شد. ویژگی‌های فیزیکی جاذب توسط آنالیز SEM و FTIR بررسی شد. سپس آزمایش‌هایی در زمینه تأثیر سرعت اختلاط، زمان، قدرت یونی و قابلیت استفاده مجدد جاذب انجام گرفت. در نهایت کارایی این جاذب در حذف اورانیم از پساب واقعی مورد بررسی قرار گرفت. آنالیز SEM و FTIR تأییدکننده سنتز و اصلاح موفق جاذب Fe3O4@SiO2 بودند. اگرچه بر اساس آنالیز آماری، سرعت اختلاط و قدرت یونی همانند زمان عواملی موثر بر کارایی جاذب محسوب می‌شوند، اما تنها سبب افزایش 5 درصد و کاهش 17 درصد راندمان حذف همزمان با افزایش سرعت اختلاط تا 250 و قدرت یونی تا 5/1 مولار شدند. بالاترین راندمان حذف اورانیم در پساب سنتتیک ۹7 درصد بود که در پساب واقعی به 49 درصد کاهش یافت. جاذب C14/SiO2_Fe3O4 با برخورداری از هسته مغناطیسی و سطحی مقاوم، علاوه بر جداسازی آسان و توانایی قابلیت استفاده مجدد بالا، دارای تأثیرپذیری اندک از تغییر سرعت اختلاط و قدرت یونی است و قابلیت بالایی در حذف اورانیم از پساب واقعی دارد. Uranium separation and removal are important from environmental, public health, and strategic veiwpoints. Scientits have put great efforts to develop technologies for uranium removal and regeneration because of its important applications and beneficial uses. In this study, efforts have been made to synthesize a modified form of Fe3O4@SiO2 and benzamide uranium complexes that can be exploited to remove and adsorb uranium onto an adsorbent that can be recycled. In the first step, Fe3O4@SiO2 was synthesized and later modified with trimethoxysilane. The adsorbent was subsequently characterized by SEM and FTIR. In a second step, experiments were performed to determine optimum stirring speed, contact time, ion strength, and adsorbent reusability. Finally, the performance of the adsorbent was tested in samples of real wastewater. SEM and FTIR analyses confirmed the satisfactory synthesis and modification of Fe3O4@SiO2 Nps. Statistical analyses revealed that although contact time, ion strength, and stirring speed were effective in adsorbent performance, they only led to a removal enhancement of 5% and a decrease of only 17% with increasing RPM to 250 and the enhancement of ion strength to 1.5M. The highest U(VI) removal efficiency in the synthetic solution was found to be 97%, which reduced to 49% in real wastewater samples. It was concluded that the nano-composite C14/SiO2_Fe3O4 adsorbent with its magnetic core and resistant surface not only offers the possibility for easy separation of urnaium from solutions but is also reusable and is only slightly affected by changes in stirring speed or ion strength. It, therefore, has a good capability for use as a U(VI) adsorbent in wastewater treatment. 1. Favre-Réguillon, A., Lebuzit, G., Murat, D., Foos, J., Mansour, C., and Draye, M. (2008). “Selective removal of dissolved uranium in drinking water by nanofiltration.” J. of Water Research, 42 (4-5), 1160-1166. 2. Ozay, O., Ekici, S., Aktas, N., and Sahiner, N. (2011). “P (4-vinyl pyridine) hydrogel use for the removal of and Th 4+ from aqueous environments.” J. of Environmental Management, 92(12), 3121-3129. 3. Domingo, J. L. (2001). “Reproductive and developmental toxicity of natural and depleted uranium: A review.” J. of Reproductive Toxicology, 15(6), 603-609. 4. Shuibo, X., Chun, Z., Xinghuo, Z., Jing, Y., Xiaojian, Z., and Jingsong, W.(2009). “Removal of uranium (VI) from aqueous solution by adsorption of hematite.” J. of Environmental Radioactivity, 100(2), 162-166. 5. Zong, P., Wang, S., Zhao, Y., Wang, H., Pan, H., and He, C. (2013). “Synthesis and application of magnetic graphene/iron oxides composite for the removal of U(VI) from aqueous solutions.” J. of Chemical Engineering, 220(0), 45-52. 6. Crane, R. A., Dickinson, M., Popescu, I. C., and Scott, T. B.(2011). “Magnetite and zero-valent iron nanoparticles for the remediation of uranium contaminated environmental water.” J. of Water Research, 45(9), 2931-2942. 7. Tang, S. C. N., and Lo, I. M. C. (2013). “Magnetic nanoparticles: Essential factors for sustainable environmental applications.” Water Research, 47(0), 2613-2632. 8. Zhao, X., Shi, Y., Wang, T., Cai, Y., and Jiang, G. (2008). “Preparation of silica-magnetite nanoparticle mixed hemimicelle sorbents for extraction of several typical phenolic compounds from environmental water samples.” J. of Chromatography A, 1188(2), 140-147. 9. Gao, M., Li, W., Dong, J., Zhang, Z., and Yang, B. (2011). “Synthesis and characterization of superparamagnetic Fe3O4@ SiO2 core-shell composite nanoparticles.” World J. of Condensed Matter Physics, 1, 49. 10. Ahangaran, F., Hassanzadeh, A., and Nouri, S. (2013). “Surface modification of Fe3O4@ SiO2 microsphere by silane coupling agent.” International Nano Letters, 3(1), 1-5. 11. Sha, Y., Deng, C., and Liu, B. (2008). “Development of C< sub> 18-functionalized magnetic silica nanoparticles as sample preparation technique for the determination of ergosterol in cigarettes by microwave-assisted derivatization and gas chromatography/mass spectrometry.” J. of Chromatography A, 1198(0), 27-33. 12.Wang, J., Zheng, S., Shao, Y., Liu, J., Xu, Z., and Zhu, D.(2010). “Amino-functionalized Fe3O4@ SiO2 core-shell magnetic nanomaterial as a novel adsorbent for aqueous heavy metals removal.” J. of Colloid and Interface Science, 349(1), 293-299. 13. Zhao, Y., Liu, C., Feng, M., Chen, Z., Li, S., Tian, G., Wang, L., Huang, J., and Li, S. (2010). “Solid phase extraction of uranium(VI) onto benzoylthiourea-anchored activated carbon.” J. of Hazardous Materials, 176(1-3), 119-124. 14. Venkatesan, K., Sukumaran, V., Antony, M., and Vasudeva Rao, P. (2004). “Extraction of uranium by amine, amide and benzamide grafted covalently on silica gel.” J. of Radioanalytical and Nuclear Chemistry, 260(3), 443-450. 15. Wei, Y., Han, B., Hu, X., Lin, Y., Wang, X., and Deng, X. (2012). “Synthesis of Fe3O4 nanoparticles and their magnetic properties.” Procedia Engineering, 27(0), 632-637. 16. Yu, P., Wang, Q., Zhang, X., Zhang, X., Shen, S., and Wang, Y.(2010). “Development of superparamagnetic high-magnetization C< sub> 18-functionalized magnetic silica nanoparticles as sorbents for enrichment and determination of methylprednisolone in rat plasma by high performance liquid chromatography.” Analytica Chimica Acta, 678(1), 50-55. 17. Camacho, L. M., Deng, S., and Parra, R. R. (2010). “Uranium removal from groundwater by natural clinoptilolite zeolite: Effects of pH and initial feed concentration.” J. of Hazardous Materials, 175(1-3), 393-398. 18. Zhang, X., Jiao, C., Wang, J., Liu, Q., Li, R., Yang, P., and Zhang, M.(2012). “Removal of uranium(VI) from aqueous solutions by magnetic Schiff base: Kinetic and thermodynamic investigation.” Chemical Engineering, 198-199(0), 412-419. 19. Han, R., Zou, W., Wang, Y., and Zhu, L.(2007). “Removal of uranium(VI) from aqueous solutions by manganese oxide coated zeolite: Discussion of adsorption isotherms and pH effect.” J. of Environmental Radioactivity, 93(3), 127-143. 20. Sadeghi, S., and Sheikhzadeh, E. (2009). “Solid phase extraction using silica gel modified with murexide for preconcentration of uranium (VI) ions from water samples.” J. of Hazardous Materials, 163(2-3), 861-868. 21. Mellah, A., Chegrouche, S., and Barkat, M. (2006). “The removal of uranium(VI) from aqueous solutions onto activated carbon: Kinetic and thermodynamic investigations.” J. of Colloid and Interface Science, 296(2), 434-441. 22. Majdan, M., Pikus, S., Gajowiak, A., Sternik, D., and Zięba, E. (2010). “Uranium sorption on bentonite modified by octadecyltrimethylammonium bromide.” J. of Hazardous Materials, 184(1-3), 662-670. 23. Jiang, H.-M., Yan, Z.-P., Zhao, Y., Hu, X., and Lian, H.-Z. (2012). “Zincon-immobilized silica-coated magnetic Fe3O4 nanoparticles for solid-phase extraction and determination of trace lead in natural and drinking waters by graphite furnace atomic absorption spectrometry.” Talanta, 94(0), 251-256. 24. Argun, M. E., Dursun, S., Ozdemir, C., and Karatas, M. (2007). “Heavy metal adsorption by modified oak sawdust: Thermodynamics and kinetics.” J. of Hazardous Materials, 141(1), 77-85. 25. Veena Devi, B., Jahaghirdar, A.A., and Zulfiqar Ahmed, M.N. (2012). “Adsorption of chromium on activated carbon prepared from coconut shell.” International J. of Engineering Research and Applications, 2(5), 364-370. 26. Tan, Y., Chen, M., and Hao, Y. (2012). “High efficient removal of Pb (II) by amino-functionalized Fe< sub> 3 O< sub> 4 magnetic nano-particles.” Chemical Engineering, 191 (0), 104-111. 27. Anirudhan, T. S., Divya, L., and Suchithra, P. S. (2009). “Kinetic and equilibrium characterization of uranium(VI) adsorption onto carboxylate-functionalized poly(hydroxyethylmethacrylate)-grafted lignocellulosics.” J. of Environmental Management, 90(1), 549-560. 28. Cao, J., Lam, K., Dawson, R., Liu, W., and Tao, S.(2004). “The effect of pH, ion strength and reactant content on the complexation of Cu< sup> 2+ by various natural organic ligands from water and soil in Hong Kong.” Chemosphere, 54(4), 507-514. 29. Tian, G., Geng, J., Jin, Y., Wang, C., Li, S., Chen, Z., Wang, H., Zhao, Y., and Li, S. (2011). “Sorption of uranium(VI) using oxime-grafted ordered mesoporous carbon CMK-5.” J.of Hazardous Materials, 190(1-3), 442-450. 30. Yusan, S., and Erenturk, S. (2011). “Sorption behaviors of uranium (VI) ions on α-FeOOH.” Desalination, 269(1-3), 58-66. 31. Dickinson, M., and Scott, T. B. (2010). “The application of zero-valent iron nanoparticles for the remediation of a uranium-contaminated waste effluent.” J. of Hazardous Materials, 178(1-3), 171-179. 32. Merdivan, M., Seyhan, S., and Gok, C. (2006). “Use of benzoylthiourea immobilized on silica gel for separation and preconcentration of uranium (VI).” Microchimica Acta, 154(1-2), 109-114.